Don’t ask Black people for more. This morning I woke up to videos of white supremacists marching with torches. Last night I attended a vigil for someone who died in segregated Black Baltimore. The white supremacists in Charlottesville are literally marching to keep places like Black Baltimore, and other economically starved areas of the country, the same. White supremacy is pervasive. It infiltrates every part of our society. It takes everything. And yet white people are demanding more. The “alt-right” white supremacists is rising because white people were cool with being silent. No other reason. I get a lot of direct messages on Twitter. I try to message almost everyone who follows me, both to check in to see if they need anything, and to verify that they’re real people. And I also get a lot of messages from people who just want to know what to do. This is the quote in the cover photo of #HeatherHeyer's profile, who was killed today in #Charolettesville. Many white people, recently woken up by the gruesome death of Heather Heyer, are brand new to standing up against white supremacy and are mired in their own guilt and shame. Many Black people who come from long legacies of fighting against oppression have messaged me too; frustrated how the progress they’ve made falls in deaf ears, or by the hand-wringing of the previously described white “allies”, or just burnt out by the trauma in general. For the latter Blacktivists; take care of yourself. Make sure you take time for self-care and healing. There’s a lot of trauma out there. For the former white people wondering what to do; there’s a lot to do. There is no shortage of books, articles, essays, listicles, step programs, active and passive actions, and instructions on what to do next. People have literally written syllabi on how to get involved. And it’s up to you to take the next step. 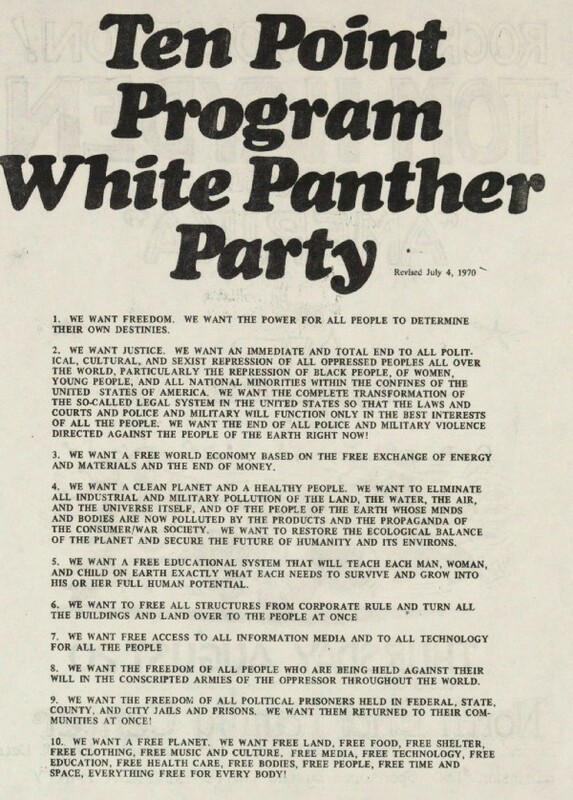 The Ten Point Program of the White Panther Party, a group of white people dedicated to ending white supremacy and supporting the Black Panther Party. If you still don’t know what to do, if you’re able, put your body on the line. Physically get in the way. Stand your ground. If you don’t feel comfortable joining a Black Lives Matter protest because you don’t want to speak for someone, protest a white supremacist rally. The “alt-right” white supremacists are rising because white people were cool with being silent. No other reason. People said racist things about a Black president and about Muslims and about immigrants and nobody stopped them. I get the argument for free speech. I get it. But nobody looked at them and said: “your racism is $%^#&^ disgusting.” And so it continues. Freedom of speech also means you have the power to use your voice to speak against bigotry and tyranny. Not using your freedom of speech to speak against someone who spouts white supremacy is an insult to those who’ve gone before. Some of your ancestors literally fought Nazis while you wring your hands not knowing what to do. Wake the hell up. And if they didn’t? Now’s your time. White supremacy never went away. It never went silent. It was never beaten. A tiny group of 17–20-year-olds stood huddled under a banner that said “VA Students Against White Supremacy”. They went out knowing they could have been harmed. They were surrounded by a throng of angry white men. When it comes time for your story to be told, for your legacy to be written, what will they say about you? Make no mistake. The white supremacists have stated overtly that they want to start a race war. They want people to act up, act out and fight them physically. Violence is to their benefit. If they receive violence, the answer with police and the law. And will be protected. 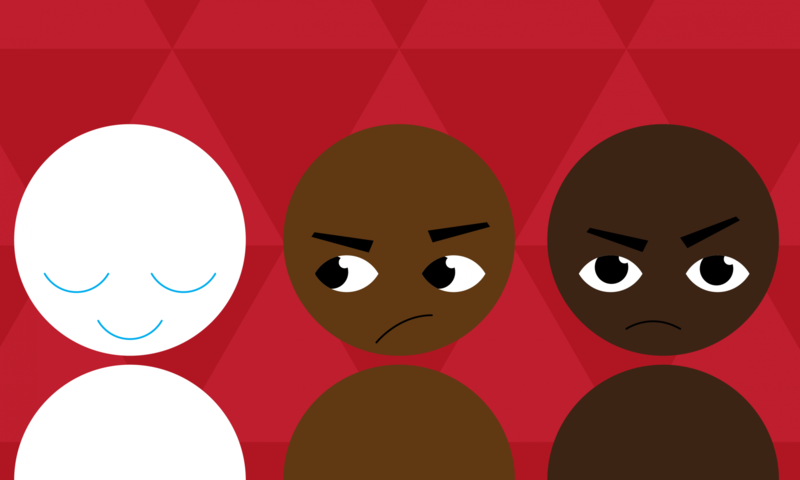 Blackness is already weaponized; Black people are viewed as aggressive just for protesting. When a fight breaks out, it is the Black person in the conflict that then gets brutalized by the police. So white people, if you choose to protest, it is your duty to protect the people of colour around you. People said racist things about a Black president and about Muslims and about immigrants and nobody stopped them. My friend @ChuckModi1, a journalist, put himself into harm’s way when supremacists turned on a Black man during the Charlottesville protest. It was a split second decision as he was live streaming, but that’s the kind of action we need to take to prevent people from getting hurt. What white people need to stop doing is demanding Black people educate us on what to do. Lord knows Black people have done everything else. The waking people up. The organizing. The songs. The chants. The rallying. The marching. The policy changes. The Resistance. This is not Black people’s fight. It is ours. Black people have done enough, don’t ask them for more. If there is a POC out there leading the charge, by all means, follow them. But don’t drag a traumatized person out and demand they lead you. Living and surviving in a traumatic system of white supremacy requires so much stamina and work that white people are never truly aware of. In the comings days and weeks, a lot of trauma will be going around. Check in with each other. Love on each other. We are all hurting when one of us is hurt. But right now, Black people and other POC have old, deep, wounds. Care for them. And if you resist, do it in ways that will help others resist, not hurt it. I’ve said this before, but the number one way white supremacist rose to power was through the silence of white people. But the number one way they got their message out was by people who were horrified by the caustic things they were saying who shared it everywhere. There is a very thin line between sharing something because you believe in it and sharing it because you hate it. Either way, it’s shared. 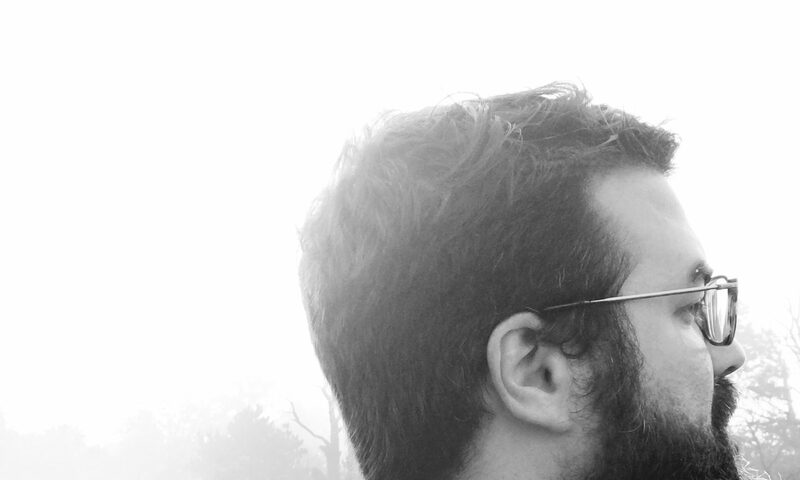 It’s important to learn how to resist without being complicit. To fight without making it harder for fellow fighters. And we must also keep in mind that white supremacists with tiki torches are the product, not the genesis, of racism. Freedom of speech also means you have the power to use your voice to speak against bigotry and tyranny. The enemy is the system designed to ensure white supremacy stays in power. Frumpy 20yr olds in polo shirts with Nazi pins are merely the foot soldiers. Our action must be centred around the abolishment and dismantling of the system of white supremacy and racism. That abolitionist will take action from all of us, in our various areas of expertise. There is no one-action-fits-all. Marching in the streets, by itself, won’t abolish white supremacy. A policy change by itself won’t abolish it. Nor will talking to your racist family members. Or making space within your workspace for minority voices. Or standing up to oppressors. Or using your economic power to further minority-owned businesses. Or working in the background of an organization. But all these actions, working in concert, can bring about lasting change. Dismantle systemic racism, and there’s no police force to protect them. Dismantle systemic racism, and there’s no school they can send their kids that won’t have POC. Dismantle systemic racism, and there’s no jury that will resist convicting them of hate crimes. Dismantle systemic racism, and there’s no room for their myopic views and their caustic bigotry and their boiling hate. There will be no room for white supremacy because the people will rise up and resist it at every turn. This is on us. And together we will win. This is inspired by some amazing and vocal Black women, including Tamika Jancewicz, Amber Dawn Mitchell, and many more.